Saudi Arabia is very guarded regarding the state of their oil fields; reserves are not known outside the kingdom. As the largest estimated reserves reside there, and as the kingdom is the lead member of OPEC, this makes the supply – demand equation for oil difficult, regardless of increasing demand from the far east and India. In the 1980’s Saudi Arabia found itself sitting on vast dollar reserves and embarked on a massive infrastructure program under the auspices of Saudi Aramco. Included were new oil processing and shipping facilities at Jubail Industrial City, and new housing and institutional facilities for migrant workers at Yanbu and Jubail. The effort was led by Bechtel. 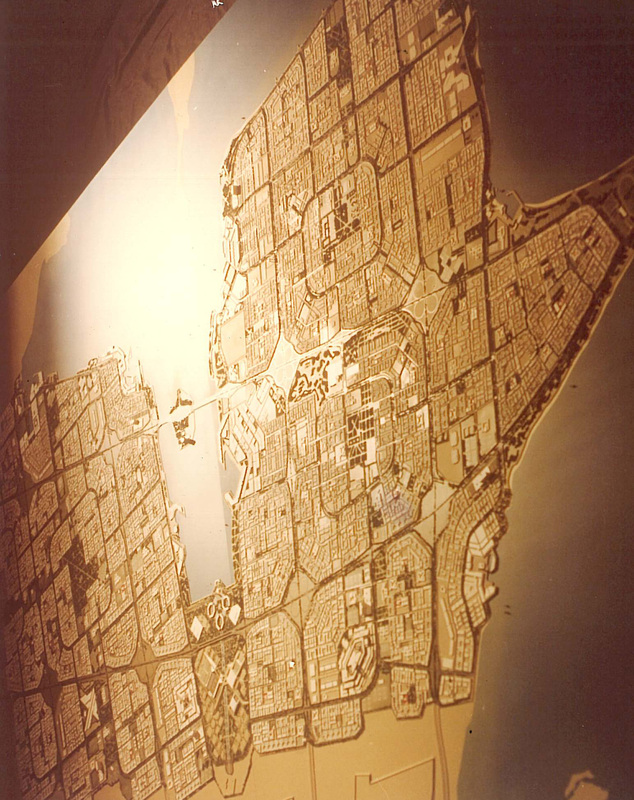 The model for Jubail’s development is shown above. It was to be a city for 400,000 workers to be built in phases with a typical housing sector providing for 10,000 residents. The urban planning was by TAC, under the direction of San Juan architect Hector Arce and myself. Because of the flatness of our site and in order to generate any slope for rainwater drainage, relatively flat mounds were built on the land, constructed from soil dredged from the sound. The dredging also provided a channel for tankers. The land-side portion of the operation was the largest landfill in history, exceeding the fill at the pyramids in Giza, according to Engineering News Record. Experts predict that the price for WTIC will either rise to $90./barrel this year or drop to $40./barrel. 2010 has added complexity regarding forward price: the economic recovery is hard to gauge. Short-term forward demand from China is uncertain, though they continue to grow the economy at over 8%. The spot price sits at $74.60 as of this post. My gut feeling: down to $70./barrel, and then, who knows? There is tremendous demand destruction going on here, and just today Valero announced further cutbacks in refining. US refining utilization stands at 81%, and anyone who has driven during rush-hour recently can note the US demand destruction first-hand. This entry was posted on January 27, 2010 at 3:57 pm and is filed under Energy and Urbanism. You can follow any responses to this entry through the RSS 2.0 feed. You can leave a response, or trackback from your own site.